ZURICH, Switzerland (CNN) -- Turkey and Armenia signed an agreement Saturday night establishing diplomatic relations after nearly a century of animosity. 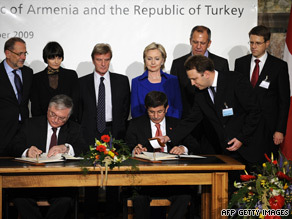 Armenian and Turkish ministers sign accord as dignitaries, including U.S. Secretary of State Hillary Clinton, look on. The signing was delayed because of Armenian objections to the wording of a final oral statement intended to be given after the signing. However, neither the Armenians nor the Turks gave a closing statement after the signing. No further details were immediately available. The agreement will open their common border within two months after it is ratified by each country's parliament. The border has been closed since 1993. Turkish-Armenian relations are often overshadowed by the dispute over the massacre of ethnic Armenians in the final days of the Ottoman Empire, more than 90 years ago. Armenians accuse Ottoman Turks of committing genocide, killing more than a million Armenians beginning in 1915. Turkey vehemently rejects these allegations. During the U.S. presidential campaign, then-candidate Barack Obama called for passage of the Armenian genocide resolution. Since his election, he has stepped back from the issue.